Profit is no more and no less than what shows up on a company’s income statement. Any income statement begins with the sales that the company generated during a given time period, which may be called revenue. The costs and expenses on the income statement are those incurred in generating the sales recorded during that time period. Revenue minus costs and expenses equals profit. Profit, income, and earnings all mean the same thing. Whereas sales is called the “top line” of an income statement, profit is called the “bottom line” (particularly net profit). There are subsets of profit that may be listed as you go along, too – gross profit, operating profit, and net profit, for example. Each one is determined by subtracting certain categories of expenses from revenue. Profit increases the equity of a company. By the same token, if a business loses money every month, liabilities will eventually exceed assets, creating negative equity. Then it is a candidate for bankruptcy. Sign up for our online financial statement training and get the income statement training or profit is not the same as cash training you need. 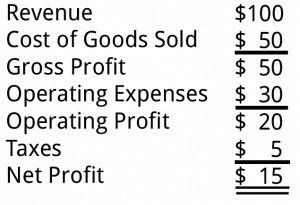 Here is a sample income statement to show how various types of profits can be reflected on an income statement. Amounts shown in thousands. In a familiar phrase generally attributed to Peter Drucker, profit is the sovereign criterion of the enterprise. The use of the word sovereign is right on the money. A profitable company charts its own course. Its managers can run it the way they wish to. When a company stops being profitable, other people begin to poke their noses into the business. Too many people in business don’t understand what profit really is, let alone how it is calculated. Nor do they understand that a company”s profit in any given period reflects a whole host of estimates and assumptions. The art of finance might just as easily be termed the art of making a profit – or, in some cases, the art of making profits look better than they really are. Learn to decipher the income statement, and you will be able to understand and evaluate your company’s profitability. Learn to manage the lines on the income statement that you can affect, and you will know how to contribute to that profitability. 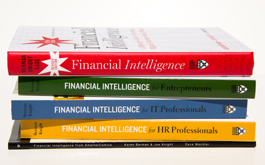 Learn the art involved in determining profit, and you will definitely increase your financial intelligence. You might even get where you are going.